I am on a strict mission not to bring new books (bought or borrowed) into the home until I have read down my tbr pile. But at the same time, being a good mother is important to me. Therefore, it was with entirely unselfish motives that I bought Wings of Fire: Moon Rising, by Tui T. Sutherland (Scholastic, Dec. 1, 2014) for my eleven year old son (he was very pleased, and sat down and read it in a single sitting), and it would have made the house messy (making me a bad mother) to have left the book lying around until I'd finished my tbr pile, so of course I had to read it myself. The fact that I truly enjoyed the first five books in the series about young dragons from different dragon factions bring peace to a war-land was immaterial (or not). This book is perhaps my favorite of the series. The dragons of the first books have founded a school that will be an institute for cross-cultural dragon understanding and learning, and they've gathered together young dragons (many of whom are deeply scarred by their experiences in the war, and most of whom distrust/fear/loath each other) to be the first students. One of these students is Moonwatcher, a young Nightwing who has the Nightwing powers of telepathy and prophecy that were thought to be lost. Moon is overwhelmed by the mental clamor of all the dragons around her....but then her mind hears what sounds like a dangerous plot that could threaten the school...and then, on top of that, her mind makes contact with another Nightwing (a truly mysterious strange powerful is-he-good-or-bad dragon and it is all very interesting indeed) and she and her cohort of dragons (one from each tribe) are plunged into a dangerous mystery. 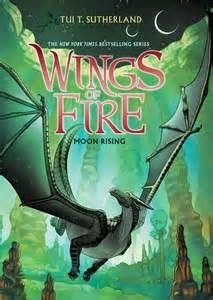 The Wings of Fire series is an excellent one to give upper elementary school readers--some tolerance for harsh and vivid violence is required, but alongside the horrors of war and its aftermath, strong messages of friendship, tolerance, and forgiveness are presented in a way that will appeal tremendously to young readers. But what I really truly liked in this installment is the new kid at boarding school story that's a large part of the book--all the details of the different dragons, and their worries and concerns, and the classes and classrooms and teachers....I love good school stories. And I love Moon and her friends. I can see that you were 100% motivated by unselfishness and not the attraction of dragons at boarding school. Always I think of others! Charlotte, the selflessness is just... staggering. Also, your modesty.